An over-achieving former Obama administration official who boasted of creating an “echo chamber” to push the Iran nuclear deal is now a political analyst for MSNBC and NBC News. 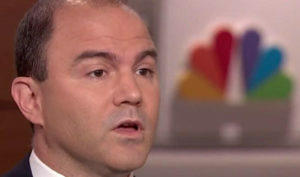 Ben Rhodes, who majored in creative writing and wound up as a speech writer during Barack Obama’s 2008 presidential campaign, had the official title in the Obama administration of Deputy National Security Adviser for Strategic Communications. He made his first NBC appearance on June 3 with Chuck Todd on Meet the Press. Rhodes also has written a memoir, “The World As It Is”, about his time in the Obama administration. “It is telling that, while the memoir will enter the historical record, it does not make its author out to be a transformative figure. And, somewhat tragically, it also diminishes Obama’s own transformative status,” Suri wrote for Foreign Policy.